Generic versions of blood-thinning medication - Plavix (clopidogrel bisulfate) - have been approved by the FDA (Food and Drug Administration). Clopidogrel bisulfate reduces the likelihood of blood platelets clumping together and forming clots in blood vessels, resulting in a lower risk of stroke and heart attack. Clopidogrel is approved by the FDA for individuals who recently had a stroke or heart attack, as well as patients who have peripheral artery disease - partial or total blockage of an artery. "For people who must manage chronic health conditions, having effective and affordable treatment options is important. The generic products approved today will expand those options for patients." Clopidogrel might not be effective with some patients with genetic factors that cause the body to metabolize the medication differently. The FDA says that clopidogrel has a boxed warning alerting doctors about this. Doctors can screen patients for the genetic factors that alter how clopidogrel is metabolized in the body. Clopidogrel's efficacy can also be affected by some medications, such as the proton pump inhibitors esomeprazole (Nexium) and omeprazole (Prilosec). Patients on such drugs may continue with high heart attack and stroke risk if they take clopidogrel. 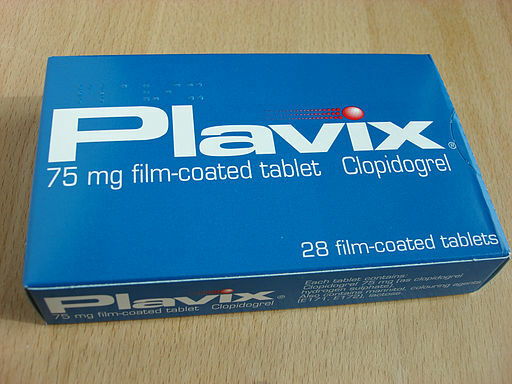 Clopidogrel is associated with a risk of bleeding, which may sometimes be severe and even deadly. Patients on this medication may bleed and bruise more easily - their likelihood of having nosebleeds are also greater. Individuals on clopidogrel who bleed may take longer than normal for the bleeding to stop. Clopidogrel comes with a Patient Medication Guide, which includes key instructions on how to use it, as well as drug safety information. The FDA emphasizes that generic and brand-name drugs have to undergo the same stringent requirements before they appear on pharmacy shelves. Brand-name and generic drugs that are FDA-approved have identical strengths and levels of quality, the Agency added. Nordqvist, Christian. "Generic Versions Of Blood Thinning Plavix Approved By FDA." Medical News Today. MediLexicon, Intl., 20 May. 2012. Web.